1: (ZERO VOLTAGE START INTERLOCK) To prevent accidental damage to loads, the output voltage control must be set to zero before the high voltage can be applied. 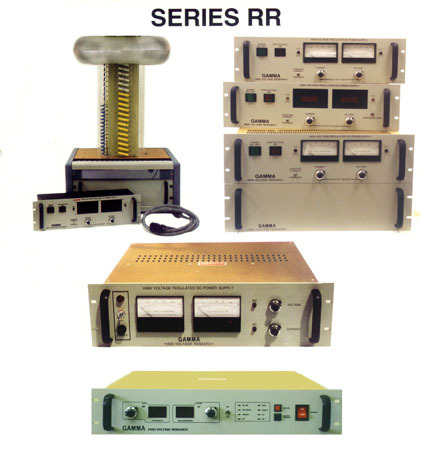 6: (SLAVED BI-POLAR OPERATION) Any two power supplies of the same voltage rating can be operated as a Bi-Polar pair. One power supply will be acting as the master controller and will control both power supplies from zero to maximum rated output voltage. The output voltage of both power supplies will track each other within 2% from 10% to maximum rated output voltage. Each power supply is also capable of operating independently. 2: (VARIABLE OVERVOLTAGE PROTECTION) This option causes the power supply to shut down when the output voltage exceeds the setting of the overvoltage control potentiometer, located at the rear of the power supply. Adjustable from 20% to 110% of maximum rated output voltage. 3: (VARIABLE OVERLOAD TRIPOUT) This option causes the power supply to shut down when the output current equals the setting of the front panel current control. Adjustable from 20% to 110% of maximum output current of the power supply. Standard feature on 600W, 1KW and 3KW units. Front panel control allows user to activate this feature when desired. 7: (TTL) Compatible “enable” line. 8: (AUXILIARY OUTPUT/FOCUS TAP) This option provides an independent auxiliary output which is variable from zero to maximum rated voltage up to 15KV at 300µA maximum. Control is achieved via front panel mounted potentiometer. 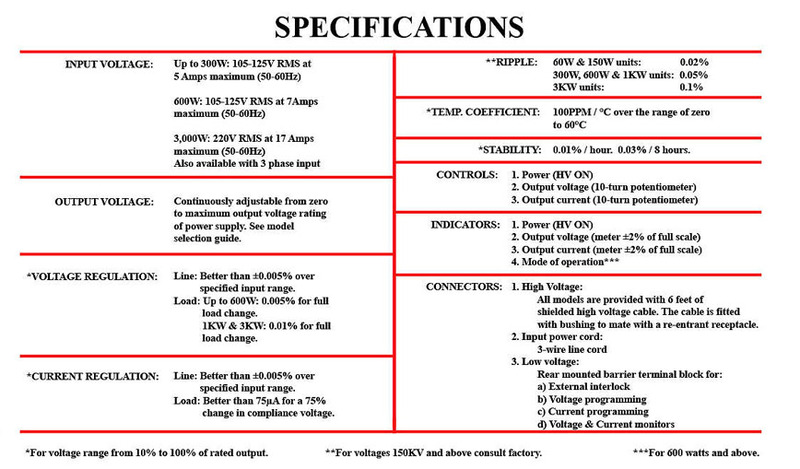 For other voltages, power levels and multiple auxiliary outputs, please consult factory. 4A: (DIGITAL PANEL METER) Single LED 3.5 digit meter reading both voltage and current. This meter replaces the analog meter normally provided. 9: (REMOTE CONTROL PANEL) Any standard model can be supplied with a remote control panel. 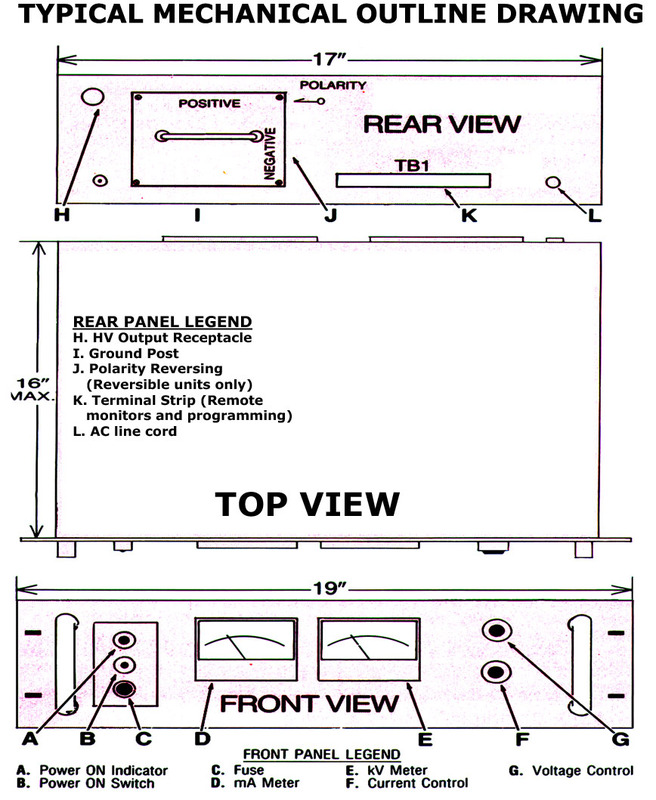 This remote control panel replaces the front panel normally provided on standard units, 20 feet of shielded interconnection cable is provided. 4B: (DIGITAL PANEL METER) Dual LED 3.5 digit meter, one for voltage and one for current. This replaces the analog meters normally provided. 10: (BENCH CABINET) A deluxe style cabinet is available for all models. 5: (SLOW START) The slow start option enables the output voltage of the power supply to ramp up to its maximum output volatge setting at a linear rate. This rate is factory set from one to fifteen seconds. 25 lbs. max PLUS HV assy.